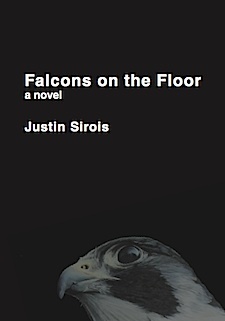 From war-torn Fallujah, Justin Sirois has birthed Falcons on the Floor. The novel dwells in the real time lives of two young men, Salim and Khalil, who try to escape the violence by traveling up the Euphrates River. Salim is intent on contacting Rana, a girl he met online who lives in Ramadi, a town forty miles away. Although Sirois did not have any in-person experience of Fallujah, he enlisted the help of a refugee from the area, Haneen Alshujary, to craft this work. Despite the difficulties of long-distance reportage, Sirois presents a believable image of an Iraq ravaged by more than a decade of conflict. The accuracy of the story and characters comes through Sirois’s immersion in the issues and people of Iraq. He and Haneen run the Understanding Campaign, an organization that provides monetary and other support to non-profits and NGOs doing aid work in and for the Middle East. In counterpoint to the Iraqi protagonists are two young American men. Sirois provides the perspectives of all of them in parallel as the story progresses, using a writing style that lays bare his roots as a poet. Sirois is saying, “If not for geography and the currents of history, this could be any one of us,” a kind of literary generosity often found in books produced by the Publishing Genius camp. “You know how it has always / been here,” Rose McLarney writes in The Always Broken Plates of Mountains, “Love always shot / with the feeling this is the last of it.” McLarney, a native of western North Carolina, consistently roots her work in that state’s landscape: a place where beauty always carries with it a threat of violence, a legacy of both tenderness and loss. A sense of the always-already fractured helps to characterize this quietly powerful first collection. “So people could try to grow / on the good land,” a neighbor declares in “Where I Will Live,” “they built in the hardest places.” Apart from the book’s self-proclaimed “Ars Poetica,” this statement seems to serve as the guiding principle for McLarney’s poetics. Meticulously crafted and delicately poised, her poetic “house” sits squarely in the rural. 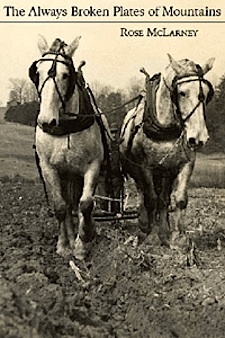 Her concern is with the people, processes, and histories of a North Carolina farming community. Each of her delicately-crafted lines is as musical and finely tuned as the next; as a whole, the poems are characterized by the restraint that was “all I had to distinguish myself” (“Covenant”). Surely, in today’s cacophonous and insistently urban poetic landscape, thriving in such terrain is a difficult undertaking. McLarney’s strength is also, of course, her weakness: this reader wishes at times for poems that deliver more formal innovation and more overt engagement with their poetic forbearers. Yet, just as she rejects a hipster aesthetic, McLarney rejects showiness for its own sake. These deeply-engaged lyric narratives nonetheless deliver consistent surprise. In two of the book’s closing poems, “Desire,” and “I Learn to Be Still Like the One I Love,” McLarney uses short, pliant lines to reference both Emily Dickinson and Greek mythology. “My love is a hunter,” she writes. “I learn / a new aim: leaving no / fingerprints, making no mark.” This is “an emphatic Thumb” whose emphasis is on its deep concentration, a hunter whose survival depends on her ability to observe the environment. McLarney’s eye and ear are dead-on. The result is a stubbornly-rooted first collection of impressive insight and craft. The vast rocky plains of the Chalbi Desert in Northern Kenya offer little in the way of hiding places or shelter from brutal winds and difficult questions. Yet he, the anthropologist, returns to the familiar barren landscape—the site of years of field research—in hopes of finding answers, of finding peace. 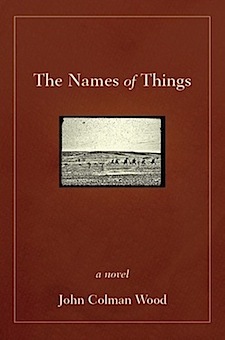 John Colman Wood’s chilling and gorgeous first novel, The Names of Things, follows a nameless anthropologist and his reluctant wife, an artist, through field research with the Dasse people of Kenya. Through marital tension, through long periods apart, through an illness that reveals long-buried secrets, the story unfolds around them as they attempt to work through emotional and physical distance in very unexpected ways. This story reveals twists and sorrow, yet the most haunting aspects of the novel are the excerpted, factual field notes on the grief rituals of the Dasse, which are dispersed and planted between each chapter of the book. The presence of these notes hint at the conflicting emotions that grip the anthropologist while he faces his loneliness and deeply painful regret. With no quick and readily available term to label or name the things stirring inside him, he is forced to step away from the scientific lens of observation and into an unsettling place of uncertainty, where he must struggle to come to terms with the absence of knowing. The mood of the Chalbi landscape echoes the feeling of being lost, of seeking answers, of reaching for something to ease the mind. But the anthropologist finds no comfort there, just more questions as he discovers that the only members of the Dasse community who may hold answers for him offer little more than clouded, vanishing memories. Through it all, The Names of Things guides the reader slowly, illustrating the reluctant, graying pace at which grief often moves. With vivid detail and thoughtful prose, Wood delivers a unique and heartbreaking story of love, loss, and the universal human experience of seeking acceptance. Chalk lines often outline reality, whether it’s a spot where a corpse laid or a tacitly understood barrier that one dare not cross. In The Chalk Circle, a collection of essays edited by Tara L. Masih, authors examine the chalk lines of the old social mainstreams that defined America in terms of “whiteness,” and other cultures by their prejudices. They force readers to widen their conceptions of just what mainstream means, illustrating how changed we have become. The greatest surprise in DePauw University professor Samuel Autman’s “A Dash of Pepper in the Snow,” is his generous explication of the anxiety that being an American other can cause. The St. Louis-born African American shares an ironic tale about how his negative reaction to an outdated expression of approval—that’s mighty white of you—from a white waitress during the time he lived and worked in Utah might have cost the woman, who was once married to a black man, a job. The Chalk Circle at turns can amuse, bemuse, and challenge readers to redefine the spaces they occupy in society. These essays quietly celebrate multiculturalism, and offer insights not often heard from a wide range of writers. They offer evidence that differences do not exclude a common link among Americans—who hope and hurt in so many similar ways. The Chalk Circle is a work that pierces the heart. Listen: God will still love you if you eat bacon. He’ll still want you if you smoke reefer or sleep with a complete stranger or download Motorhead on your MP3. No, you ain’t going to burn in hell if you use a condom. And My Father knows as well as anyone that in the right circumstances, sometimes vodka really is the only solution. This is Davidson’s Sermon on the Mount, a somewhat different take on Matthew’s gospel. It’s no wonder local and federal authorities are investigating him. There are Biblical parallels: apostles, a Lazarus character, pickup trucks in place of camels, and motorized fishing nets to bring in miraculous catches. Sam’s mother, Roxy, is a suffering Madonna with a taste for white lightning. Zurhellen has created living, passionate characters to recount this story rather than the pious representations we are accustomed to from religious literature. The story line moves from the Sermon on the Mount to Sam’s death and resurrection, and includes recreations of the Acts of the Apostles and a couple of Paul’s epistles. 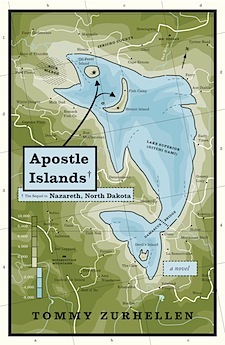 Apostle Islands is a sequel to Zurhellen’s Nazareth, North Dakota, which covers the birth and early life of this latter day messiah. It’s no Sunday school version of the gospels, and often reads as satire, which may test the faith of some readers, but develops into a story about a community of caring, loving people who try their best to get by in a difficult world. His message, though, is not a hopeless one. It is, rather, recognition that we exist and that existence is a miracle. All this falling then, is not written as warning, but as a poetic near-death experience that leaves one more awake. There is something for everyone in this collection. Young plays the poles perfectly—eternal, yet topical. In his poem, “Articles of Faith,” he writes, “I used to like Nicole Kidman / now I like Kirsten Dunst. / Jennifer Aniston is a schmuck / but Brad’s sure a rotter…Demons walk the earth. / Says so on a T-shirt.” In just over 100 pages he touches on politics, weather, love, death, fame, birth, dancing, fate, diseases, swans, rocks, and flaming scarecrows. His range, more so than ever, is dazzling and impressive. Young’s typical form and structure is also at work. In “Madrigal” for example, he writes in strange, un-heroic couplets, like a deranged Pope, “Maybe we put too much faith in the heart / when any blockhead knows everything falls apart, / turn to mush the storied administrations of the brain, / there’s no statue that won’t eventually dissolve in the rain.” He writes short and long; sometimes in tight quatrains, sometimes allowing the poem to roll over several pages in one long blocked stanza. In previous collections, Young has always allowed his poems to do with him what they will, and this collection is no exception. 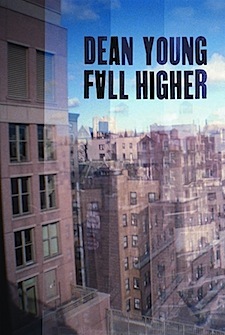 Fall Higher offers the best of Young. There is internal slant rhyme, perfect end rhyme, jokes, gibberish, and rubbish—a whole whirlwind of chicanery. But his work wouldn’t be what it is without its powerful and grave emotional undertow. It’s as though the reader wades out into an unmarred river only to be torn underwater. You come up breathless, nostrils burning, scared, but alert and newly clean. 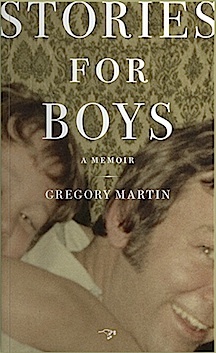 In Stories for Boys, Gregory Martin creates an intense familial memoir about his reaction to his father’s emergence as a gay man with an addiction to anonymous sexual encounters. The book is aptly named, referring to several different boyhoods: Martin’s own, which he revisits, wondering if his past is now tainted by the residue of his father’s double life; his young sons’, featuring their embodiment of innocence and his struggle to protect them while honestly communicating with them about their grandfather; and his father’s nightmarish childhood, punctuated by the physical and sexual abuse he endured from his own alcoholic father. Martin’s adeptness at characterizing the story’s key players throws the reader into a cascade of emotional turmoil. One is immersed in sympathy for Martin, in the midst of his confusion and anger; for his strong-willed mother, deceived for the entirety of her marriage; and for his contemplative, penitent father, who navigates the awkward waters of coming out in his senior years, recovers from a suicide attempt and battles memories of paternal molestation. Yes, his homosexuality was a shock. But the real, lasting shock is that unquenchable desire that I never, not once, had any intimation or sense of—that he was so profoundly different from the man I thought I knew. 1,000 men. The self-loathing and shame and dark, inner loneliness; the cathartic, self-flagellation that must accompany the confession of such a number. Besides his ability to write sentences of utter devastation, Martin also weaves evocative comparisons between his father and the life and writings of Walt Whitman. He makes the book all the more distinctive and accessible by including emails from his father, family photos, children’s drawings, tree house diagrams and pop culture images. Stories for Boys is, in essence, stories for everyone. It is an artful journey from betrayal to forgiveness, of a father attempting to safeguard his children from the heartache that comes with honesty while raising them to possess open minds about those of all sexual orientations, and of a son reconciling the father he thought he knew with the man he comes to know.